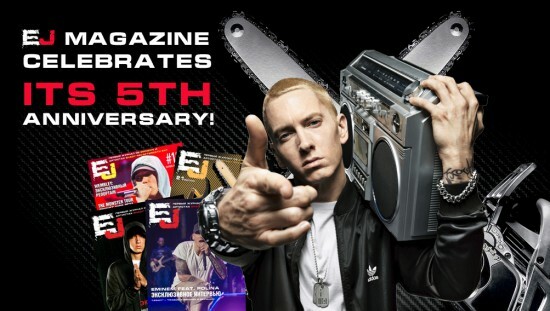 5 years ago, April 30, 2012, the editorial staff of “Eminem.Pro” published the first issue of the EJ magazine. Initially, it was just a simple online digest. But later, it turned into a full glossy magazine with a large readership. Today, like five years ago, our magazine is still being published and available for everone absolutely free of charge! On the occasion of its fifth anniversary, the management of ePro decided to have a look at how “EJ” was created and what it went through on its way to the current success. In the spring of 2012 Eminem and artists of the Shady Records label became very active, therefore, there were too many news. Everyone was waiting for Eminem’s eighth album and Slaughterhouse’s «unfinished» “Welcome to: Our House” album. During one of the conference calls we decided that it would be great to release a small news digest, which would contain all the latest news for a few months. It will allow readers, who had not followed the news for a long time, to esealy get caught up with them. So, we decided to call this digest “Eminem Journal”. The work on the first edition began in mid-April 2012. We took the most interesting and important news published on our project for the last 4 months. In addition to Eminem’s news, we have included the information on Kendrick Lamar and Eminem’s protégé — Skylar Grey, fan clubs of which we took under our wing at that time. We had no designers, no experience in that field. The design was invented on the go, just like the logo of the digest. On April 30 we published the first issue. In fact, we did not expect that we would produce the digest on a regular basis. The main task was to collect all the numerous latest news in one place and make them available for new readers. 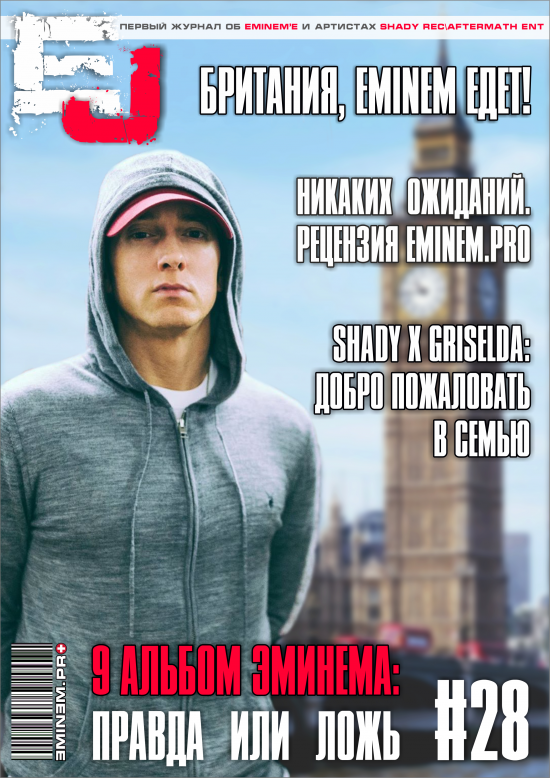 When the magazine was out, it got the approval and good criticism from fans and readers of “Eminem.Pro”. Then, we decided we should continue what we started. In May one of our follower, Dmitry Kustov, aka Dee23, decided to join our project. He offered us his help with the creation of covers for our magazine. We had so many news, that by the end of May we released the second issue of the “Eminem Journal” with a new designer cover. The coverage of the second issue gave us a clear understanding that the fans were into our project, so we needed to gain momentum in the further development of the journal. The following editions came out in the same simple, sculptured design, but already in the semi-automatic mode, which allowed us to save some time. In the summer of 2012 we had a new team member – Anastasia Mishchenko, designer from Studio Intree. She has redefined the concept of the magazine cover, developed by Dima. Already August 31 we released the fifth edition of the “Eminem Journal” with a new designer cover. This cover is still included in our top best covers of “EJ” for all time it’s existed. In the spring of 2013 we decided that we should develop the journal, embodying the ideas in more specific form. In subsequent months we published several experimental releases. Gradually, we changed the magazine and its image, there were also introduced new sections. The journal itself was renamed to “EJournal”. The inner content of the magazine was a regular selection of news wrapped in a simple “packaging” and presented in the form of a typical pdf document. The turning point in the development of the journal took place when we got in our team our longtime designer and consultant on all questions related to the design — Olga Olegovna. Olga joined the project on June 26, 2013. She showed us her vision of how the magazine should look. She recently graduated from the uniersity majoring in “graphic design” and was full of creative ideas and willingness to help us and develop “Eminem.Pro” project. Moreover, she was a big fan of Eminem. What else do you need? We gave Olga the test task (to make a logo for the Russian fan club of Skylar Grey, which is still in use today) and in August, 2013 she completely remade the magazine, changing it beyond recognition. Perhaps, the most significant change was the name of the magazine and its logo. The magazine officially became known as “EJ”. In addition, there were produced more than 30 versions of the logo, of which we chose the most attractive and appropriate to the style of the magazine. Now you can find it on all our covers. The second important change was the approach to the magazine creation. It was 100% hand laid out design, which was elaborated individually for each specific news. I should admit, the magazine looked amazing. Besides, for the new reboot of the magazine our editorial team organized an exclusive interview with DJ Tony Touch, who works for Eminem’s radio Shade 45. At that time, Tony released his mixtape “PieceMaker 3… Return of the 50 MCs”, including a track with Eminem. Another feature of the new release was the cover that, with the permission of Jenny Risher, author of “Heart Soul Detroit: Conversations on the Motor City”, had a photo of Eminem from her photo shoot. New “EJ” was released on August 06. To say readers liked is to say nothing! We received hundreds of great reviews. Since then it became quite clear for us that the new concept of the magazine was approved, in the first place by our readers. On October 01 we released another issue in the new design already, which was modified to a greater extent than the previous one. In the next issue Olga decided to go a step further and themed the release of “EJ” to the celebration of Halloween on October 31. A new edition was published on October 30, the day when Eminem dropped out his MMLP2 album. The whole design was designed in the style of Halloween traditions. We performed a tremendous job. Later, this tradition became entrenched and embodied in the annual “Halloween” and “Christmas” editions of the magazine. The third great turning point in the development of the EJ magazine was the spring of 2014. At that time we were actively developing mobile apps for iPhone and Android. We knew that sooner or later the magazine would be transferred to mobile devices, where usability is completely different. A bold decision was taken to develop a new unique design for the magazine. In fact, we again changed the approach to the design, remaking it from scratch. We took into account all possible nuances: how articles would look like, if the magazine could be read on narrow and wide screens, big and small ones. We did a meticulous job selecting the fonts and colors of different elements. So, here is how the new style appeared, which we use and carefully refine up to this day. Now “EJ” is going through another development stage for the fourth time. When our team was added by the iOS and Android developers — Ilya Inyushin and Nikita Grib, we moved our magazine onto mobile devices. The magazine has become exclusively and freely available on “Eminem.Pro” apps for iPhone and Android, while we headed for the development of the new design. In the near future, I hope you will be able to appreciate it. The app and the magazine debuted in the top twenty of the iTunes apps. They are also on the 38the place in the top of Google Play “best news apps”. “EJ” today is a unique project, which still has no analogues in the Russian segment of the Internet, not even in any foreign one. There is no such artist, for whom his fan community would release “his” own journal. Over the years, the editors of “Eminem.Pro” were able to communicate with almost all the performers and the management of the Shady Records, and we were very pleased to find out that they are all aware of the existence of the EJ magazine and they like it. Within this five-year period of work on EJ, we had some exclusive interviews and wrote a large number of exclusive materials. What was important for us is that we could transform our magazine, doing one job after another. All this allowed “EJ” to grow and develop. So, now we are working on another concept. Our main problem is time, its lack, being specific. But it is quite possible that very soon you will see the magazine in a brand new way. Stay tuned!